For the celebration in the former Soviet Union and Israel, see Victory Day (9 May). Victory in Europe Day, generally known as VE Day (Great Britain) or V-E Day (North America), was celebrated on Tuesday, 8 May 1945 to mark the formal acceptance by the Allies of World War II of Nazi Germany's unconditional surrender of its armed forces. The formal surrender of the German forces occupying the Channel Islands did not occur until the following day, 9 May 1945. It thus marked the end of World War II in Europe. The term VE Day existed as early as September 1944, in anticipation of victory. On 30 April 1945, Adolf Hitler, the Nazi leader, committed suicide during the Battle of Berlin. Germany's surrender, therefore, was authorised by his successor, Reichspräsident Karl Dönitz. The administration headed by Dönitz was known as the Flensburg Government. The preliminary act of military surrender was signed at 02:41 on 7 May in SHAEF HQ at Reims, and the final document was signed on 8 May in Berlin. 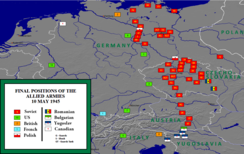 The former Soviet Union, Serbia, and Eastern Bloc countries have historically celebrated the end of World War II on 9 May; Israel marks VE Day on 9 May as well as a result of the large number of immigrants from the former Soviet Bloc, although it is not a public holiday. In Ukraine since 2015, 8 May is designated as a day of Remembrance and Reconciliation, but it is not a public holiday. Final positions of the Allied armies, May 1945. Upon the defeat of Germany, celebrations erupted throughout the western world, especially in Great Britain and North America. 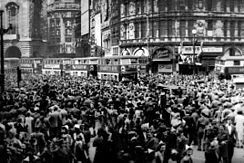 More than one million people celebrated in the streets throughout Great Britain to mark the end of the European part of the war. In London, crowds massed in Trafalgar Square and up the Mall to Buckingham Palace, where King George VI and Queen Elizabeth, accompanied by Prime Minister Winston Churchill, appeared on the balcony of the palace before the cheering crowds. Princess Elizabeth (the future Queen Elizabeth II) and her sister Princess Margaret were allowed to wander incognito among the crowds and take part in the celebrations. In the United States, the victory happened on President Harry Truman's 61st birthday. He dedicated the victory to the memory of his predecessor, Franklin D. Roosevelt, who had died of a cerebral hemorrhage less than a month earlier, on 12 April. Flags remained at half-staff for the remainder of the 30-day mourning period. Truman said of dedicating the victory to Roosevelt's memory and keeping the flags at half-staff that his only wish was "that Franklin D. Roosevelt had lived to witness this day". Later that day, Truman said that the victory made it his most enjoyable birthday. Massive celebrations took place in many American cities, especially in New York's Times Square. Tempering the jubilation somewhat, both Churchill and Truman pointed out that the war against Japan had not yet been won. In his radio broadcast at 15:00 on the 8th, Churchill told the British people that: "We may allow ourselves a brief period of rejoicing (as Japan) remains unsubdued". In America, Truman broadcast at 09:00 and said it was "a victory only half won". The instrument of surrender stipulated that all hostilities had to stop at 23:01 (CET), 8th of May, just an hour before midnight. Since it was already 9th of May in the European part of the USSR, most post-Soviet states, including Russia, as well as Israel (as a result of the large number of immigrants from the former Soviet Bloc -see above) commemorate Victory Day on 9 May instead of 8 May. Italy (25 April) "Festa della Liberazione" (Liberation Holiday). United Kingdom: In 1995 the May Day bank holiday was moved from the first Monday in May, 1 May, to Monday 8 May, for that year only, to commemorate the 50th anniversary of the ending of the Second World War. East Germany as Tag der Befreiung (Day of Liberation), a public holiday from 1950 to 1966 and in 1985. Between 1975 and 1990, as Tag des Sieges (Victory Day (9 May)). France as Victoire 1945. Orléans simultaneously celebrates both V-E Day and the anniversary of the Siege of Orléans being lifted by French forces led by Joan of Arc during the Hundred Years War on this date. Poland as "Narodowy Dzień Zwycięstwa" – National Victory Day. Ukraine (9 May) "День перемоги над нацизмом у Другій світовій війні" (Victory Day over Nazism in World War II) — from 2015. British Channel Islands Liberation Days: Jersey and Guernsey (9 May), Sark (10 May) and Alderney (16 May). ^ "BBC History: VE Day". BBC Online. Retrieved 3 May 2016. ^ Harper, Douglas. "VE Day". Online Etymology Dictionary. Retrieved 12 March 2016. ^ Hamilton, Charles (1996). Leaders & Personalities of the Third Reich, Vol. 2. San José, CA: R. James Bender Publishing. pp. 285, 286. ISBN 978-0-912138-66-4. ^ "Victory in Europe Day". Retrieved 3 May 2016. ^ "Welcome to the Dunmow & District Branch of The Royal British Legion". The Royal British Legion. Retrieved 22 March 2019. ^ "VE Day". www.simcoe.ca. County of Simcoe. Retrieved 5 May 2017. ^ a b "Truman Marks Birthday". The New York Times. May 9, 1945. p. 6. ^ a b "Victory Wreath From Truman Is Laid On Hyde Park Grave of War President". New York Times. Associated Press. May 9, 1945. p. 15. ^ "Army Extends Mourning Period". New York Times. Associated Press. May 12, 1945. p. 13. ^ United Press (May 15, 1945). "30 Days of Mourning For Roosevelt Ended". New York Times. p. 4. ^ Telfer, Kevin (2015). The Summer of '45. Islington: Aurum Press Ltd. p. 75. ISBN 978 1 78131 435 7. 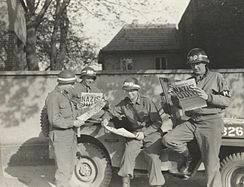 Wikimedia Commons has media related to VE Day. Rare audio speeches of the famous historical persons of the USSR, etc. 50th Anniversary Celebration of VE Day in Moscow on YouTube by Leon Charney on The Leon Charney Report.